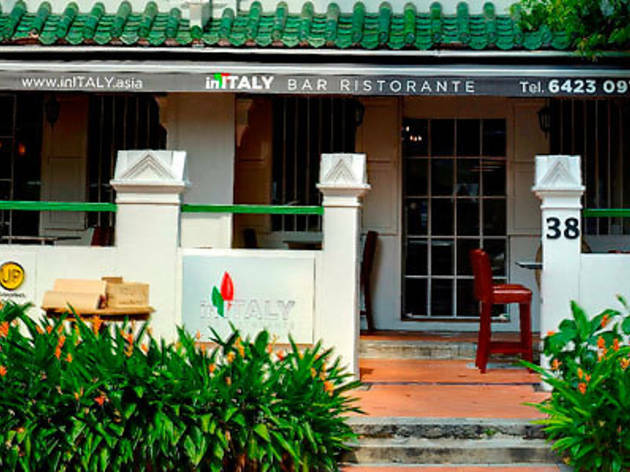 Owned by former Forlino chef Mario Caramella, inITALY is certainly less fancy than the One Fullerton stalwart, with an ambience somewhere between homey trattoria and slick modern Italian. 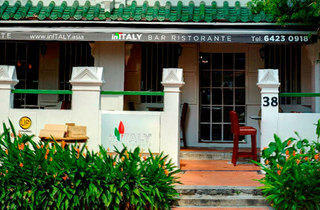 Caramella worked for Hyatt Bali before Forlino, and elements of his former employer are evident in the slightly corporate logo and crisp decor – leather banquettes and open bar, with jars of oil and other Italian goodies on the shelf – though touches like the old racing bikes attached to the ceiling add character. There are a few tables outside. If it hardly looks revolutionary, neither is the classic Italian menu, with the exception of a few specialities – but it’s good, starting with the addictively comforting beer bread basket, which comes with every meal here – little hot bread parcels, like empty ravioli, with a parsley salsa verde. Antipasti are unpretentious and beautifully executed, if a touch overpriced – like a subtle Prosciutto San Daniele ($18) with truffle honey, artichokes and little roasted onion balls which pop out of their skins. The pasta portions aren’t big, but there’s plenty of quality in dishes such as a balanced squid ink linguine ($18) with prawns, bottarga (tuna roe), broccolini, garlic and chilli. The speciality, though, is the Tuscan gran bollito ($28), a kind of Italian pot-au-feu filled with boiled beef, veal, chicken, pork-veal tongue and vegetables. Served with a little selection including horseradish flakes, salsa verde and sea salt, it’s hearty but somehow not overpowering – aside from the slightly stringy chicken, the meat is fall-apart flaky and the sausage almost creamily tender.